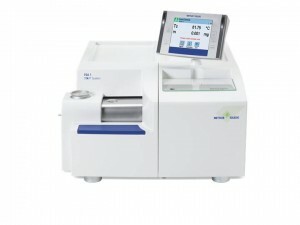 Schwerzenbach, Switzerland – 6 December, 2012 – METTLER TOLEDO is pleased to announce the launch of its new, dedicated thermogravimetric analyzer TGA 1. This highly sensitive analyzer offers easier characterization of plastics, elastomers, thermosets and many more materials. In fact, the TGA 1 is the only thermogravimetric analyzer on the market that measures up to 50 million resolution points continuously down to 0.1 µg for a 5 gram sample weight. Additionally, with no weight range change required when switching between small and large sample sizes, a wide variety of sample types can be measured in succession to help generate the kind of productivity increases that positively impact a manufacturer’s bottom line. The heart of the TGA 1 is its METTLER TOLEDO balance cell. Internal calibration ring weights built into METTLER TOLEDO’s most precise micro and ultra-micro balances help manufacturers characterize materials with a very high degree of accuracy. This provides the wealth of information required to ensure heat- and moisture-sensitive materials will perform as expected in their final context, helping to shorten manufacturing lead times, enhance product consistency, and reduce liability and rework. The TGA 1’s modular design increases its flexibility and ease-of-use. Efficient automation for 24/7 sample handling and a variety of furnace/crucible sizes help broaden the TGA 1’s application range. Easy set-up means less operator training time. Also, an ability to handle temperatures from ambient to 1100 ̊C provides a complete thermal analysis in a single step process. Results may then be analyzed quickly using versatile, intuitive STAR® software and reporting. To further ensure accuracy, the TGA 1 has a precisely defined furnace atmosphere. A horizontal furnace design minimizes possible turbulence caused by thermal buoyancy and purge gas, while a gastight cell that can be purged with a defined gas atmosphere offers unambiguous information and quality results.